An 8-week online self-study class where I guide you step-by-step on how to build a life you love by starting with the inner work first and mastering your mindset. Because when you get the inside right, the outside falls into place. So, what exactly is Your Best Life? This is my signature, best-selling, online course that teaches you how to master your mindset first before you take any action. This is truly the secret to living your best life: doing the inner self-development and mindset work first. That way, you've mastered your mind and your nasty inner critic, fears, doubts, or worries aren't steering the ship preventing you from going after what you truly desire. This course gives you the missing piece to the puzzle. 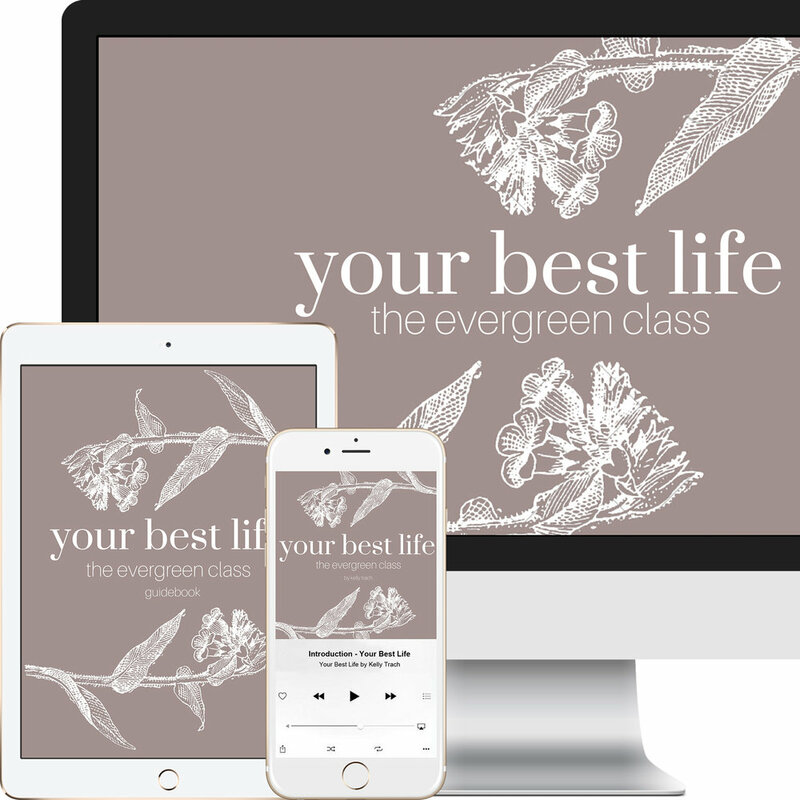 This course is also evergreen - meaning that it's self-guided and you can enroll anytime because your best life starts right now. You are truly the only person standing in your way. This course hands you the tools to unearth and overcome issues that crop up for you (that you might not see) which keep you stuck, uncertain and blocked. Step-by-step instructions on rebooting your mind and adopting new beliefs. How to uncover your self-limiting beliefs and ditch them for good. Relinquish blocks that are holding you back. How to do the mindset work in order to step into the person you yearn to become. Clarity, ease and a whole lotta badass gumption to go after your burning desires. Living your best life, your dream life, and living in alignment with your highest vision only comes after you've mastered your mind because when you get the inside right, the outside falls into place. That's what you're getting when you sign up for this: the handcrafted recipe on how to make it all click internally. What makes Your best Life different? 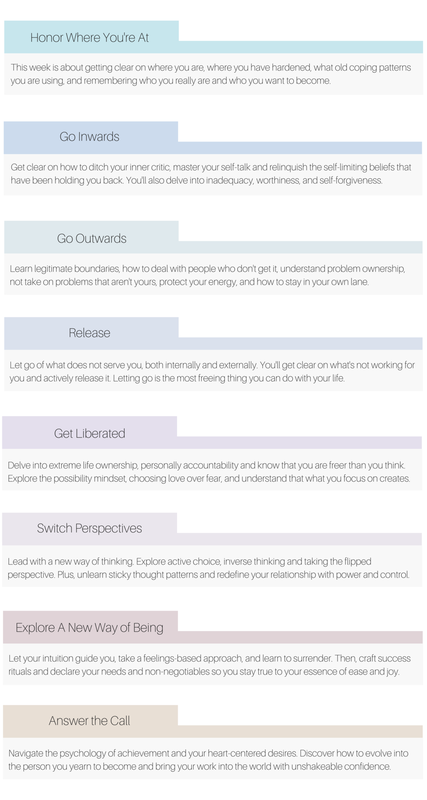 Wherever you are or whatever journey you are on, these strategies are flexible and applicable to your situation. Your training materials are yours to keep forever, the platform is always open, and you keep all of the recorded lectures. You'll rewrite the rules, unlearn old patterns, and approach life from a whole new way - with your mindset first. Eight 1-hour coaching calls (in both video and audio format). All recorded so you can listen again, pause when needed, and take notes. Dedicated coaching to guide you and awaken your greatness. Jam-packed with takeaways, journaling prompts, and space for your own a-ha moments. Hop on to the online platform or the app and listen on-the-go. Your course materials are there forever and you can listen anytime. I'm virtually in your pocket. "I’m a huge advocate of Kelly’s work and this course is no exception! Kelly takes complex and abstract concepts and makes it understandable and easily applicable to my everyday life. 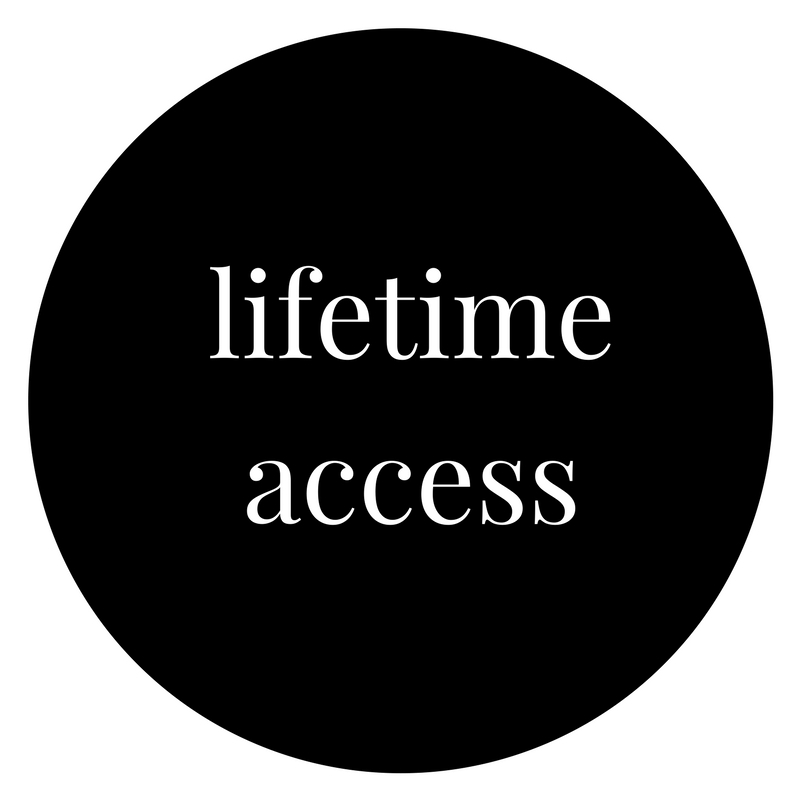 I highly recommend taking the plunge and enrolling in Your Best Life – you won’t regret it!" "Your Best Life is a course that has been truly life changing for me. Kelly’s inspiring energy, paired with her warm and uplifting teaching style raises you up and helps you to meet her there. I am so happy I took the plunge and joined this course, it has been one of the best investments in myself I’ve ever made and I highly recommend it if you are considering signing up. Whether you’re planning big life changes or just want to feel more confident and free right where you are now, you will love this course! " You are a people pleaser and have a hard time setting boundaries or turning people down, so you feel like your own projects and personal time is always on the backburner. If you feel inadequate, accepting love, gifts, money and compliments always feels uncomfortable, and you have a tendency to seek love and approval from outside yourself. You are driven to perpetually achieve more, usually for goals that look good on paper. You never feel satisfied. More is more. When you hit your sales goal, now you don't have enough time or when you get the gig, you still don't have the partner. You feel like good things are scarce. Not enough time or money or friends or ripe avocados at Whole Foods. As a result, you hold on to what you have very tightly. You love control and having the upper hand in all situations. Surrendering, trusting, and allowing are like foreign words to you. You want to elevate your life and find those like-hearted gems who will support you. What does evergreen mean? This class is 100% evergreen, which means that the course is fully available to you all at once. It's all pre-recorded and packaged up for you so that you can take the class at any time, go at your own pace, and enroll anytime. I've never done coaching with you before, where can I get a flavor for your teaching style? Ooh! Good question, listen to the solo shows of my podcast. How are the 8 modules structured? Each module is 1-hour long and there are designated reflection questions after you're done listening. If you choose to do the reflection questions in the custom guidebook, they will take you approximately 20 - 30 minutes. My intention is for you to really just marinate in this work and to allow space and time for reflection between modules. I'm nervous. If you get the full body "YES!" you should come anyways! It's okay if you've never been coached before or done anything like this. FYI: there's a big section on overcoming fear, doubt, and worry. What is the time commitment? My aim is for you to do the thought work in real time as you go about your week. This is an integrative course and my teaching style is rooted in implementation versus heaps of homework. It's as much or as little time as you want! Can I get a refund? This course is final sale. I ask that you commit 100% to being here and showing up. Integrity, life ownership, and personal accountability are what I teach and I practice that through my coaching policy. I encourage you to explore the terms and conditions here so you know what I expect from you and what you can expect from me! Do you offer a payment plan? Yes, indeed! You can do 3 monthly installments of $116.